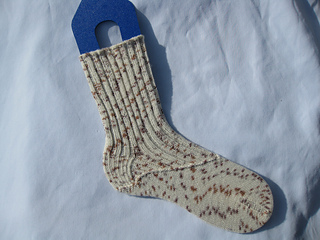 In a fit of insanity (which is the only explanation possible) I decided to knit socks as prizes for my Girl Scout troop. Not only did I not come to my senses, but I even shared the idea with my co-leader. This sock pattern developed out of my need to not knit the same plain socks over and over in a month. The pattern incorporates the gusset decreases with twisted stitches to form diagonal lines that mimic the spats worn over shoes. 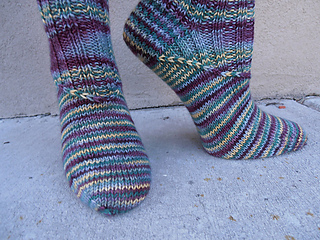 This pattern works very well with variegated yarns. For the gauge -- If you get stitch gauge and your row gauge is a little off, that’s fine. 3 stitchmarkers are also needed.